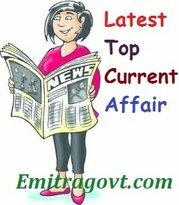 Current Affairs Question 2017: Looking for 2st August Current Affairs? Then start your Quiz right now by answering them. Here in this article, we are giving the Current Affairs Quiz with Questions and Answers. As many people are preparing for various government exams it became mandatory for them to get a grip over the current affairs as in most of the tests are based on Daily Current Affairs. By taking this kind of Current Affairs Quiz candidates can eventually get hold of what they have been working on. Contenders can trust us as we will update all the latest Current Affairs in this quiz. For more such quizzes check our site Emitragovt.com regularly as we will update the Daily Quiz for current affairs. 1. The Maharashtra state government is planning to create cycle tracks through ‘streets with cycle track’ project in order to encourage the use of bicycles, to ease congestion and reduce air pollution. 2. Los Angeles formally announced its bid for the 2028 Summer Plympics after agreeing on a deal with the Olympic organizers. This deal with Olympic organizers paves the way for Paris to host the Summer Olympics in 2024.With this Los Angeles will be hosting the games for the third tim since it first hosted in 1932. It last hosted Olympics in 1984. Games in Paris, the French Capital, marks 100 years since the last tie it hosted the Games. Paris last hosted the Olympics in 1924 and had narrowly lost out to London or the right to host the 2012 Games. 3. Ustad Hussain Sayeeduddin Dagar, a classical vocalist and one of the leading exponents of Dhupad tradition, passed away following a brief illness in Pune. He was 78 and is survived by his wife and two sons. Known to his admires as Sayeed Bhai, Sayeeduddin belongs to Dagar family of musicians that is the only one to practice Dhrupad, a form of Hindustani classical vocal music. He is the 19th generation of the family practising this form of music. With his demice, Sayeeduddin’s sons Nafeesuddin and Aneesuddin Dagar will now be the 20th generation of the family to practice Dhrupad. 4. An Army medic from Michigan who risked his life multiple times to rescue Vietnam War comrades is the first person to receive the Medal of Honor from President Donald Trump in Washington. Trump presented America’s highest military honor to James McCloughan at a White House ceremony. McCloughan was a 23-year-old private first class who had been drafted into the Army when, in 1969, he found himself in the middle of the raging, days long Battle of Hui Yon Hill. McCloughan voluntarily entered the “kill zone” to rescue injured comrades, even as he was pelted with shrapnel from a rocket-propelled grenade. 5. The Central Board of Direct Taxes (CBDT) entered into nine Unilateral Advance Pricing Agreements (UAPAs) with Indian taxpayers in the month of July 2017. The APA Scheme endeavors to provide certainty to taxpayers in the domain of transfer pricing by specifying the methods of pricing and determining the Arm’s Length Price of international transactions in advance for a maximum period of five future years. 6. According to the OECD-FAO Agricultural Outlook 2017-2026 report, India is the world’s third-largest beef exporter and is expected to retain the spot in 2026. 7. American swimmer Caeleb Dressel equalled compatriot Michael Phelps’ 2007 record of most golds at the World Aquatics Championships, winning his seventh gold in the competition. 8. Ferrari’s Formula One racer Sebastian Vettel won the Hungarian Grand Prix title. 9. The Reserve Bank of India imposed Rs 1 crore penalty on Union Bank of India for non-compliance of KYC norms. 10. According to Moody’s, India’s GDP growth rate will be in the range of 6.5 to 7.5% during the next 12 to 18 months. 11. Veteran Karnataka BJP leader B B Shivappa passed. He was 89. 12. US second seed John Isner defeated Ryan Harrison his fourth ATP Atlanta title. 13. The world’s smallest spacecraft successfully launched into low-Earth orbit by Indian rocket Polar Satellite Launch Vehicle (PSLV). Known as ‘Sprites’, these tiny satellites are just 3.5cm x 3.5cm. 14. The Renault-Nissan alliance overtake rivals Volkswagen and Toyota to become the world’s largest carmaker. 15. Eminent classical singer Ustad Sayeeduddin Dagar died. He was 78.